with a rebuttal to my post yesterday. Yesterday, I fired off a rather abrupt (re: pissed off) email to Blake after his column on the 2011 growing season. Blake graciously asked me to polish my email into a column. Thank you for this opportunity, Blake. First off, here is my perspective on the 2011 vintage in California. 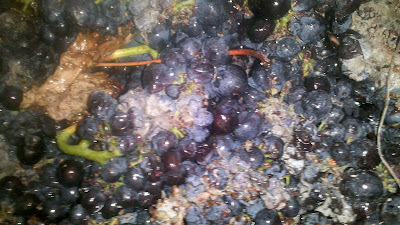 There are going to be some excellent wines made in 2011, largely those picked before the rains that started on Oct. 3. There are some good wines made that were picked just before or just after the Oct. 3 rains. These grapes were in a window of ripeness, but not truly fully ripe. In many cases, these grapes were picked because the grapes were ripe enough but botrytis was already an issue in the vineyards, and they wouldn’t deal well with the rain. After the unexpected rain of Oct. 10 (which primarily hit the North Bay counties of Napa and Sonoma), many grapes started to deteriorate rapidly and rot became a major issue. In many cases, picking decisions became more a case of triage than of harvesting great grapes. Vineyards in the Central Coast, not hit by this second rain, often continued (and still continue) to ripen in good shape. So, there you go, a vintage of mixed quality, ranging from great to poor. I have spoken to many friends who make wine, from those who make lower-alcohol, leaner styles of California wine to those who make a bigger, riper style and they are largely of the same opinion. Of course, there are exceptions, and some of those came to light in the comments to Blake’s column yesterday. So, why did Blake’s column piss me off so much? 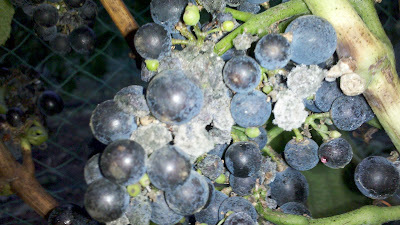 Pinot Noir grapes rot on the vine. Photo by Adam Lee. "For the last fortnight hard rains hit northern California, and people who hadn't yet picked their grapes -- which included most makers of red wine -- are now dealing with water-bloated berries and botrytis. They're praying for hot dry weather so they can get their grapes ripe and concentrated. So they can make those 16% alcohol Cabernet Sauvignons we all know and love." The sugar is 20.5; however, the pH is quite high at 3.69 and, with over 60% malic acid (due to the cool growing season) this wine isn’t the crisp wine that Blake so cherishes. Rather, it is a numerical mess. Yes, that’s one of our wines. We picked this Syrah because it was rotting, literally, on the vine. Was that because the yields were too high? No, they were down over 50% from last year. Was it because the vineyard was poorly managed? No. Leaves were pulled on both sides of the vine prior to the rain, sprays were done, etc. Had we not picked this Syrah, the grapes would have been lost entirely and the grower would have had no income at all. This is one of our growers who we have worked with since 2001. She is our friend. We know her family, we go out to dinner with her, we work with her son in the vineyard, and we were at her husband’s funeral. She is a good person and didn’t deserve this to happen to her fruit. And I would like to think we deserved better fruit, but it didn’t happen. Of course, many growers don’t deal with smaller wineries that may pay for the fruit anyhow. These growers are contracted by medium-to-large wineries. They are trying to deal with the damage that has been done by rot, which in some vineyards has moved from botrytis to grey rot, to sour rot. These growers are trying to get enough of a crop off the vines so that they can survive, make mortgage payments, make property tax payments (due in December), and put food on the table for their family. In many cases, these growers were not able to meet minimum contract sugar levels before the rain (usually around 22 brix, maybe 13% alcohol, not the 16% that Blake berates) and certainly they haven’t been able to make those sugar levels since. Now, contract clauses regarding percentage of rot are coming into play and growers are having their entire crops rejected by wineries. Perhaps these growers paid for crop insurance (some signed up after last year’s small crop) which will help them perhaps break even with farming costs (less likely in a year like 2011 which required more work in the vineyard). The other option is that some of the really big wineries (usually owned by larger corporations) are coming in and paying $1000 a ton for grapes previously contracted at $2000-$3000 per ton. And the growers still have to pay harvest costs ($300-$400 per ton), and what were already tiny yields before the rain and the rot are now miniscule. In my opinion, there is nothing here to be celebrated. Those of you who know me know that I love, as much as anybody, to engage in philosophical debates about ripeness, alcohol levels, and on and on. But there is a point where philosophy gives way to humanity and where wine style doesn’t mean a hill of beans compared to good people being able to survive in the toughest economy of my lifetime. This harvest won’t make surviving easier for anyone. And for that I am very sorry, not cheerful. -- Adam Lee. Well said Adam. In addition to your call for humanity, I would call for better education before making such proclamations. Some basic vine physiology would go a long way to bringing better decorum to the debates about alcohol, balance, and California wines. Right on, Adam. Well said. I couldn't agree with you more. Many times it's easy to forget that growers and winemakers struggle with challenges that they cannot predict or control in addition to those challenges we all face like the economic downturn. More wine writing should be interspersed with technical information such as this. Or more wine writers should talk to more winemakers and wine growers to get the explanation before referencing what they think they know. UPGRADE: Blake for posting Adam's revised pissed off email. Winemakers,try to limit your pissed off emails during harvest...maybe get a keg on the crushpad or something...like the good 'ole days. Why are California vineyards so economically vulnerable? Are there certain reasons for a lack of crop insurance, for example? Wine grapes appear to have a much higher profit margin than other agricultural products, so what am I missing? Very well said Adam. The very fact that you can be so cogent in the midst of this rough harvest is impressive. Well said Adam. And well done Blake for putting this up. After putting your foot in it with the last post you were looking like persona non grata. I think Blake was just reacting to the Fish/Weed piece at Spectator and the usual BS that Bonne put up in the Comical the other day. Sadly, this discussion comes off as agenda-driven opinion exchange in the media echo chamber. I blame Ted Turner and Rupert Murdoch. Seriously, those of us with an economic stake in how our products are perceived are going to have to start fact-checking wine journos more aggressively. It seems to me there's only a really superficial disagreement here, on whether or not the bad 2011 harvest is a "good thing." Substantially, what Lee and Gray talk about are totally different (the plights of growers vs. stylistically different wines), and I don't see why they can't both be right. In Santa Rita Hills we have had little rain this year - about 1/2 inch two weeks ago. That was followed by two days of strong winds and three very warm days. Almost a perfect situation. With the cold summer we have this year almost a perfect between flavors, pH, acids and nutrients. Fastest fermentations I have ever seen - and no yeast added! Hey, Adam, you should be out in the fields picking grapes or in the winery picking your nose, not sitting at your computer doing what we writers do: pounding out missives that categorically define what you do for our voracious reading and drinking public. You let us do our job and we'll let you do yours, deal? Otherwise, we'll forever be depending upon the largesse from people like you to get our occasional free gourmet meals! Not... happy 2011 harvest, my friend! Adam, thanks for being the voice behind small producers and growers. While 2011 has been a major challenge, there will be good wines made in a variety of styles. I certainly understand Blake's idea that this vintage will force many wineries to release wines that are stylistically different than their norm. However, the challenge will still be selling the wine after the media has declared the vintage a disaster.